Easy to play... Hard to stop laughing. It will put a laughing spell on you. 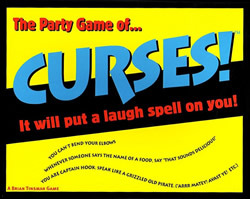 Curses! is a card game of wacky rules that people give each other. Anyone who makes enough slip-ups is out of the game and the last one remaining is the winner.